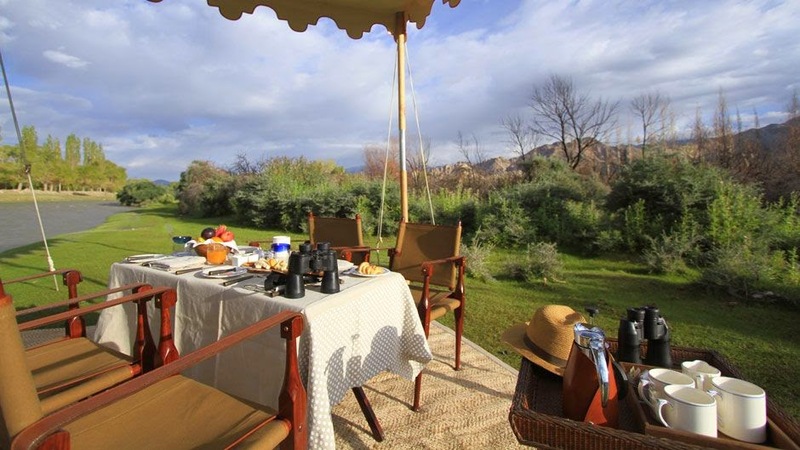 Fast catching up the attention of the new generation of discerning travelers, glamping offers outdoor enthusiasts and travelers looking for off the beaten path experiences, an upgrade on relaxation, leisure and rejuvenation. A fusion of glamorous and camping, glamping doesn’t require you to pitch a tent or set up a camp. Instead, it offers a way for you to experience the outdoors and underrated yet great locales without compromising on comfort and luxury whether it be a Swiss tent, hut, tree house, tent or a beach front villa. Glamping sites in India are fast emerging as alternate escape for travelers looking to stay close to nature. 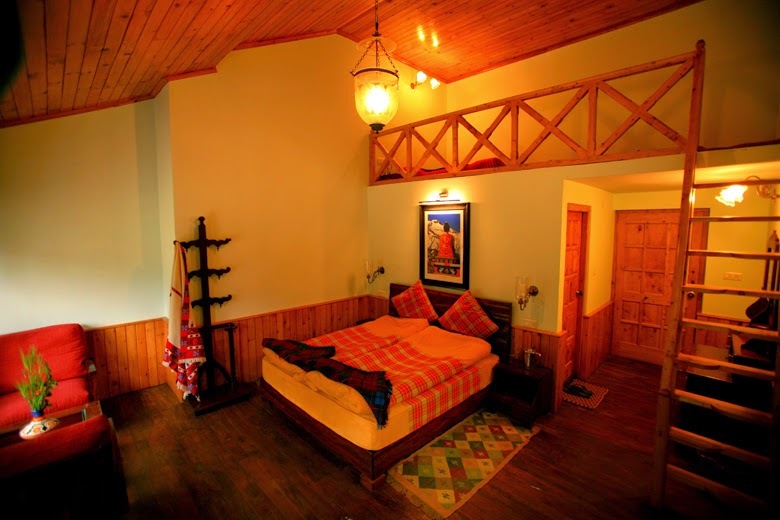 Comfy accommodations, healthy meals prepared from fresh, homegrown organic ingredients, unspoiled surroundings away from the buzzing “tourist” spots and off the beaten path experiences that includes nature walks, cultural interactions and insider experiences makes glamping a very good travel option in India. 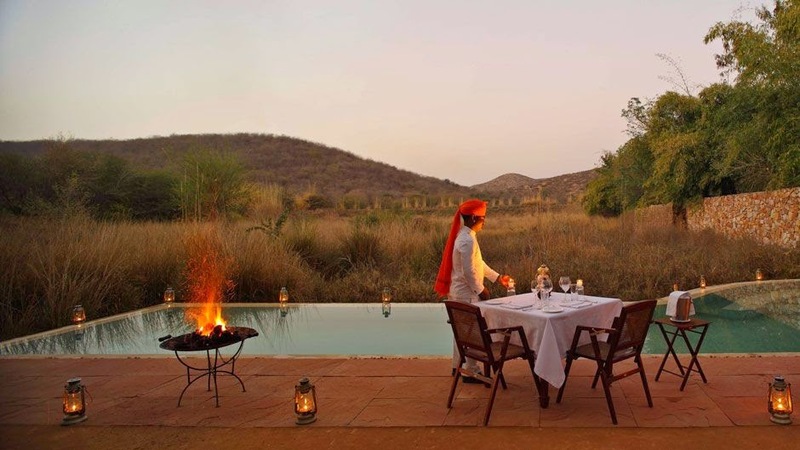 With 12 hand-stitched tents, this Sujan property in Ranthambore National Park is one of the finest luxury jungle safari tents in India. 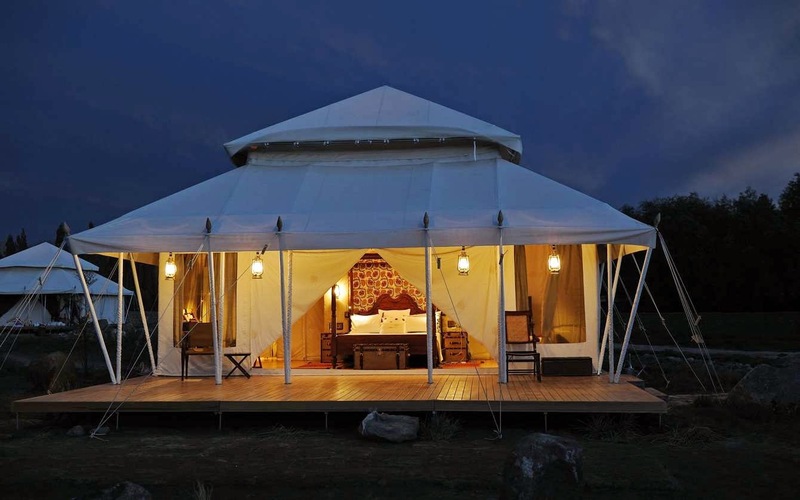 Redefining glamping in India, these luxury tents modeled after hunting hut of maharajah of Jodhpur with their Edwardian furnishing will transport you way back in time. Although you won’t be shooting tigers as did the maharaja, you will experience a lifestyle as opulent and elegant as enjoyed by them. Nestled in well manicured lush lawns, the tents are pitched in arc. The interior are quaint and at the same time “a hedonist’s delight”. Enjoy cocktails and get high on spirit at the alfresco bar and embark on a safri arranged by the camp itself to sight the royal predators and the ultimate find in the wild; the Royal Bengal Tiger, take aim and shoot but remember the camera will have to do. 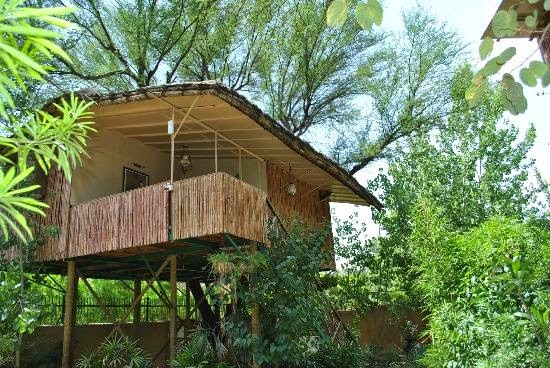 Largest of its kind in the world, the Tree House Resort located at Nature’s Farm 30 minutes drive away from Jaipur City will take you back to the nature but with panache. With air conditioning, Wi-Fi and all the other trapping of urban life that you’ll find in a luxury hotel rooms, the “nests” - each named after a bird found in the area - nestled on the keekar tree with live branches running through them takes you as close to nature as possible in as much luxury as you could envisage. There are two restaurants named Machan and Peacock. While the former serves Indian, Chinese and European food, head to the latter to get high on local and imported liquors in an unhurried ambience. 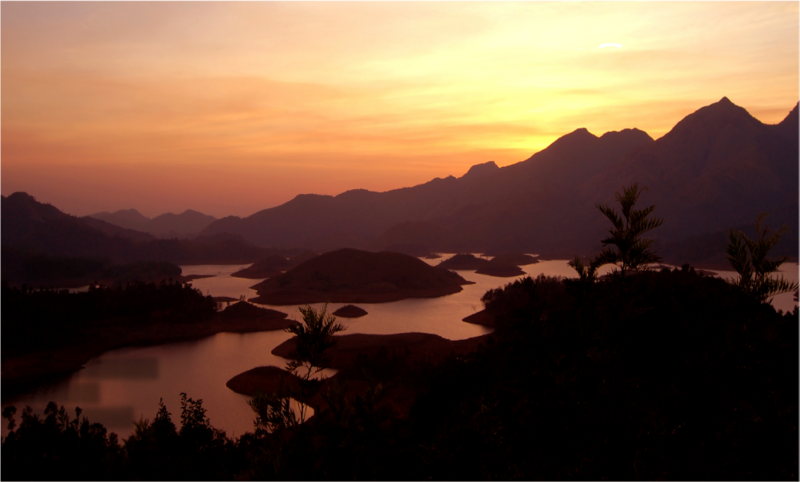 The rate starts from INR 12,000 per person per night that includes meals & taxes. 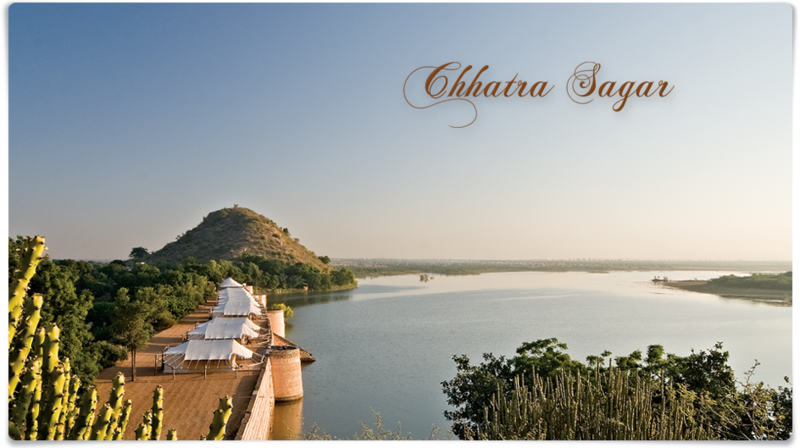 The luxurious hand-stitched white linen tents are set spectacularly on the edge of Chattra Sagar Lake on a 100 year old dam. One of the finest places in India for glamping, Chhatra Sagar offers accommodation in a total of 13 luxury tents that comes ensuite with full bathrooms that features hot showers, Wi-Fi facilty keeps you connected with the world whereas the state of the art amenities and gracious hospitality makes these luxury camps home away from home. Stylish, luxurious and a place close to nature…actually the sun-kissed beach, is what is on offer when you decide to stay at this luxury camping site in Goa. This off the beaten track with its cream canvas tents and Portuguese setting offer serene off the beaten path hideaway in otherwise touristy Goa. The highlights of the tent are not the iPod deck, air conditioning of the Wi-Fi but the sight of the turtles on the pristine golden sands and alfresco dinner beneath star shining brightly overhead. The luxurious accommodation inside the elegant tents feature an artful mix of modern and antique Indian decorative touches, hand-woven fabrics and hand-crafted wooden furniture recycled from old fishing boats (amongst other things). 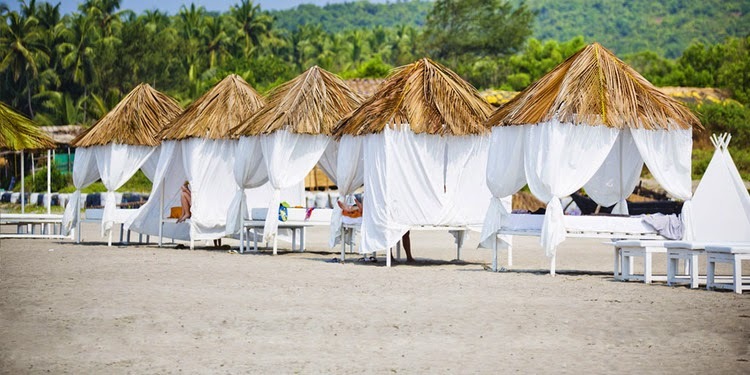 This beach-side camp is truly one of the most romantic glamping sites in India. 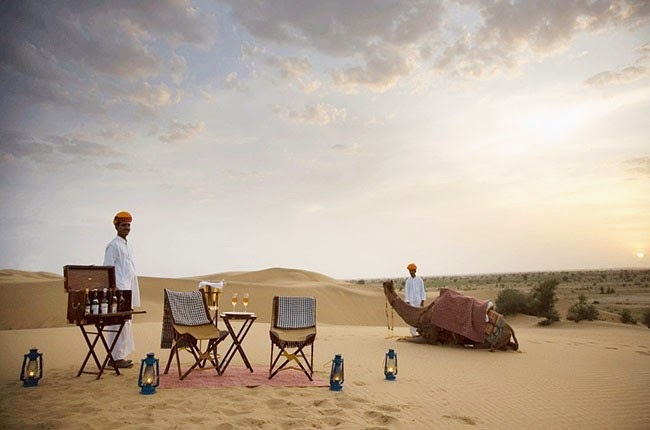 The Serai sits amidst the sand dunes of Jaisalmer in the desert kingdom of Rajasthan in a caravanesque ambiance, reminiscent of the days of the yore when Rajput warrior princes used to camp amidst the desert on their royal detour. 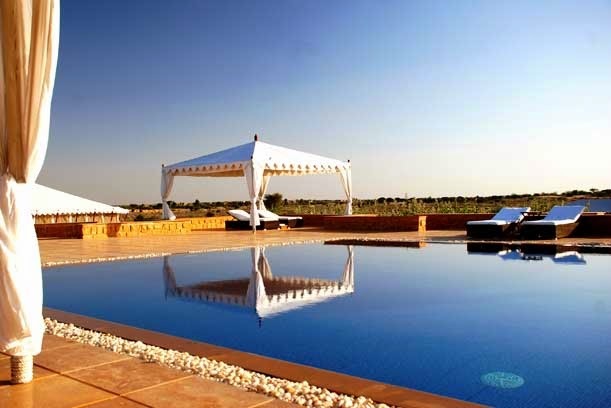 One of the finest luxury camping sites with a rejuvenating spa parlour, the Serai, Jaisalmer is set amidst 100 acres of desert scrub that will transport you to an Arabian Nightesque ambience. The evenings spent under the canopy of a starlit desert sky is made all the more punctuating by the ancient melodies of Manganiyar tribesmen whose songs have haunted these dunes for centuries. Dining experience at The Serai reverberates with the eclectic tastes of Rajputana and an exquisite selection of menus made with home grown farmed produce. Complimentary bicycle rides, bamboo raft riding, bird watching tours and village lunches and walks, is what is in store if you are at Grassroots. 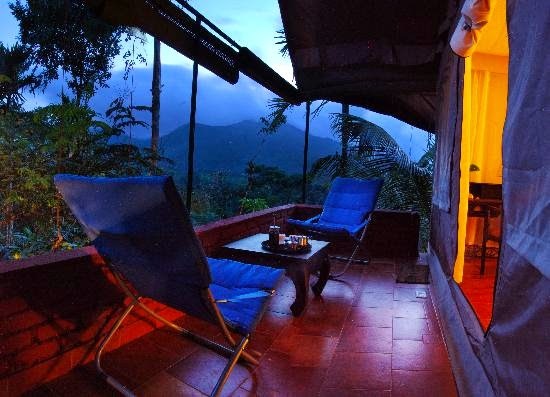 Isolated, hidden and camouflaged well within the verdant green in the sleepy corners of the not so touristy Wayanad, Grassroots offer luxurious stay as close to nature as it gets but with all the trappings of the urban life. From the inside, the camps are as plush and elegant as a five star hotel suite could get. Leathered chairs with sitting, iron wrought beds with comfortable sleeping and the state of the art amenities make sure that you have one of the finest experiences of glamping in India. A private porch area allows you to sit and gulp your hot cup of coffee as you behold the verdant coffee plantation, perched on the top of a hill overlooking a river below. 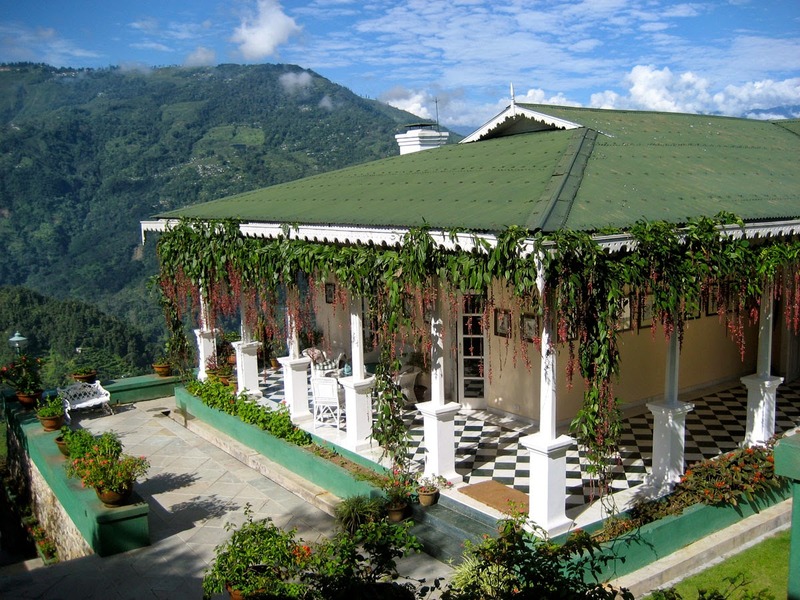 As idyllic as it gets, Glenburn Yea Estate, located in the verdant county of Darjeeling in West Bengal is a place where you could really claim that you are away from the “crowd.” This picturesque tea estate overlooking the mighty Kanchendzonga peak of Himalayas offers one of the finest glamping experiences in India. 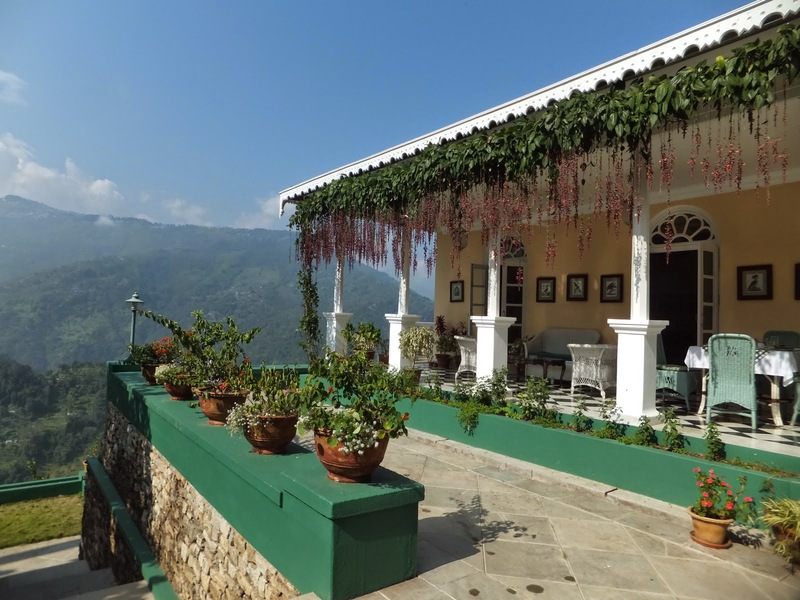 There are 4 plush suites that form the main planter’s bunglow each offering awe inspiring view of the towering Himalayas and the lush countryside fringed with tea gardens. 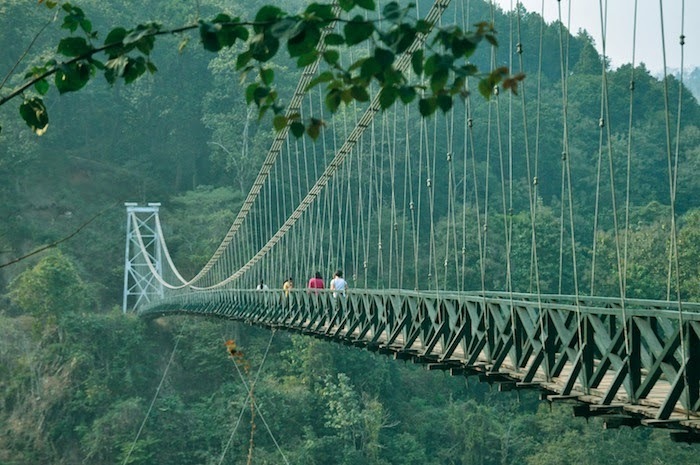 When in Glenburn’s Tea Estate, just don’t stay, learn how to make and brew the tea that you love, spot the birds and the bees, head off to the secluded lodge with our beloved to have lamplit dinner or just amble around fishing trouts, glamping at Glenburn Tea Estate will truly take your breathe away. 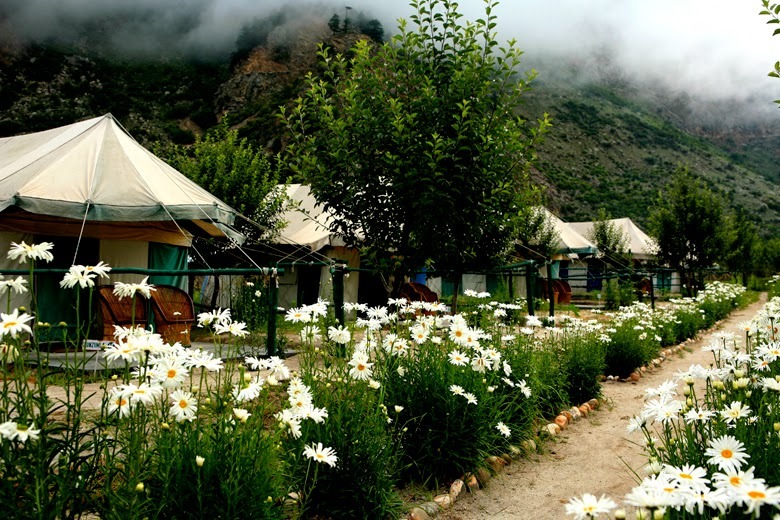 Located in the lap of Himalayas along the road less travelled, the Banjara Camp and Retreat lovated in Sangla, Himachal Pradesh on the bank of Baspa river is a mesmerizing place for glamping in India. 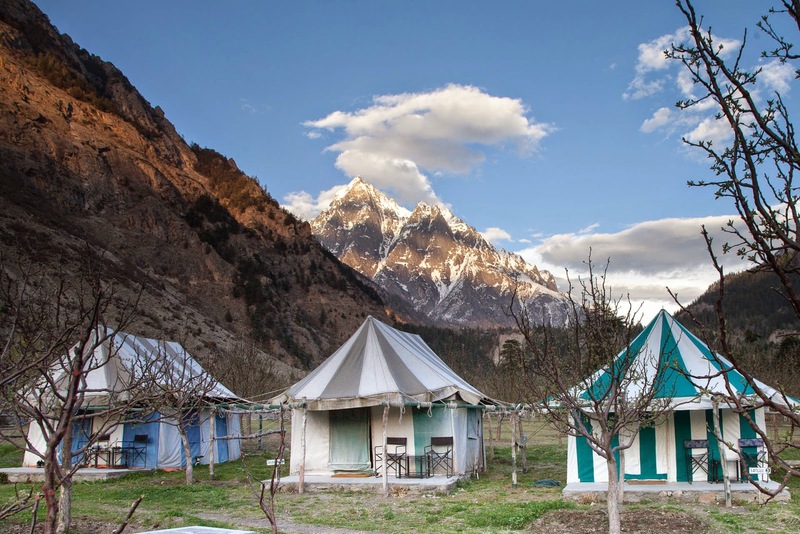 Cocooned amidst the apple orchards and verdant greenery, Banjara Camp and Retreat is a true luxury camping experience with options such as rapelling, treks into the less trodden Himalayas, cultural interactions in local villages and rock climbing activities. You also have the option of doing nothing and pass your time in leisure in one of the luxurious swiss tents that come equipped with attached washrooms and running hot and cold water. 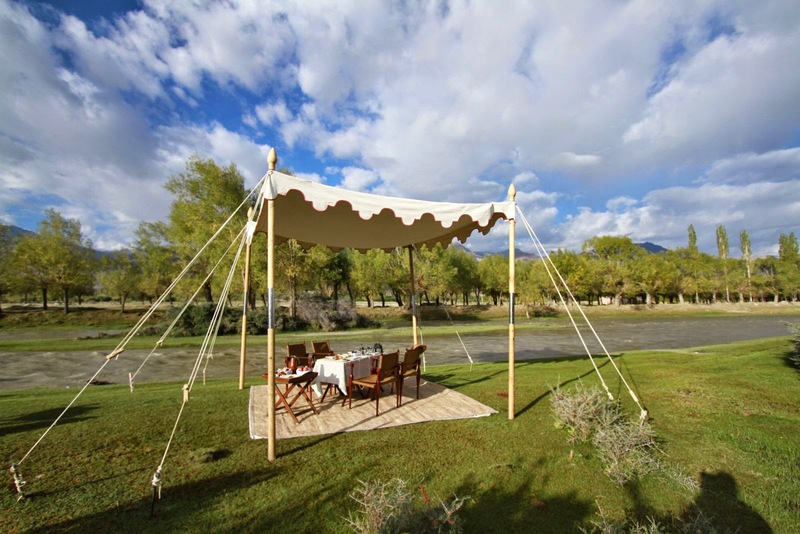 Any list talking about glamping or luxury camping in India will remain incomplete if we don’t talk about camping in Ladakh, one of the most surreal and ultimate places to travel in India. 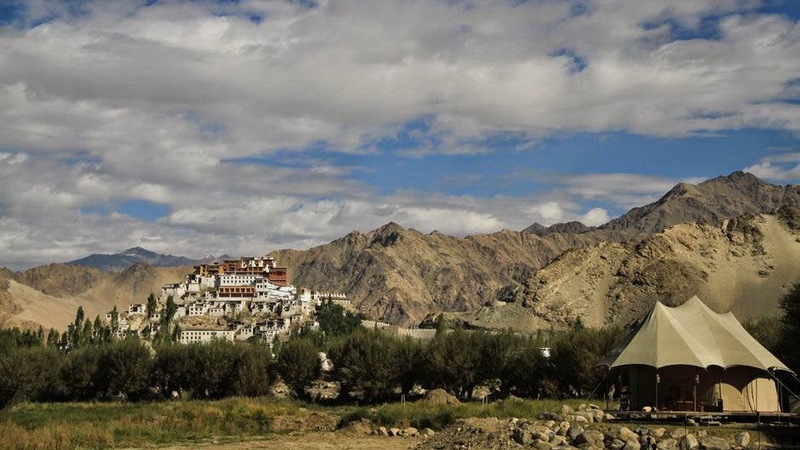 With a culture immersed in Tibetan Buddhism, lofty monasteries, stunning high altitude lakes and some of the highest motorable roads in the world, Ladakh is one of the places of a lifetime to be visited in India. The stark terrain, patches of green and colorful prayer flags give the most awe inspiring colors to the otherwise stark landscape to this upper Himalayan kingdom. The Ultimate Traveling Camp located in Thiksey, which also houses the largest and most stunning of the monasteries in Ladakh offers lavish accommodation in its clean white linen tents tucked in the lap of awe inspiring Himalayas. 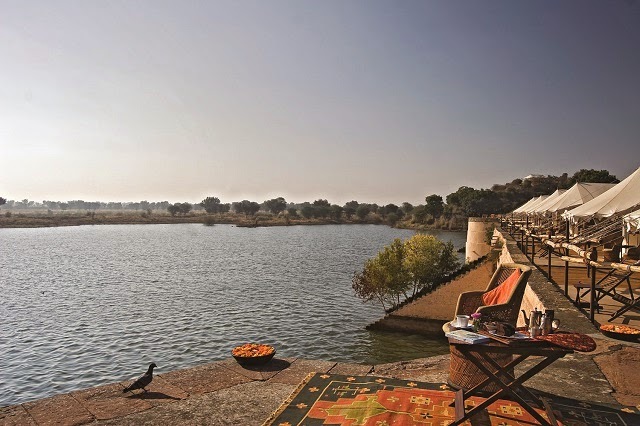 Ensuite bathrooms, private sit outs, four poster beds and a truly off the beaten path experience makes the Ultimate Travelling Camp in Thiksey one of the best places for luxury camping or glamping in India.